Bear with me for the whole story, please... It seems long but follows a liine of thought. I got into the Echo scene simply to learn how to help My Quadriplegic Aunt become more independent in her entertainment choices. I bought the Echo and a Harmony Hub and tested them to figure out how best to set up a voice controlled AV environment that she could have personal control of... WORKS GREAT! Does so much more for her than my set up does, simply because she has cable TV set up, and All I have is DVD player, Playstation and internet available on my TV set up. Basically, I bought one, then bought her one as well. Hers is a dot only due to room and size... I have the full sized Echo... they work exactly the same. So... Here's what we did to help work this out. Of course he gets the headphone thing for sure! He desrves his entertainment too!... so we bought a single Hue Light bulb and a Bridge, and hooked up a lamp that sits next to his TV. When she needs something she can ask alexa to turn on "HIS LIGHT" and she does... alerting him visually so he can respond quickly and she will always have that available to her as a safety... no matter who is in the house. WE will eventually get a color hue bulb and give her scenes to choose to allow for grades of need as well... red alert being the highest form of course... the two of them will have separate echo dot's to control it with so he can re-set it and go back to watching TV if things are easily remedied. All in all, this echo thing has a lot of potential for everyone whether for entertainment, accessibility or whatever comes up. Just thought I would share another way to use it for another issue cured. Great that you found a solution, I would like to offer add-ons to what you've already done and achieved if it's of interest to you. If you're aunt is hard of hearing then she may not know if Alexa understood what she said so you may need two lamps that come on in both rooms simultaneously. The colours idea is good too, each meaning something different. As an alternative and this would depend if your Aunt & Uncle have a PC or not. The attached image shows an old Apple touch (1st Generation) that no one really wants anymore and picked up for loose change. This is mounted on a microphone gooseneck stand and looks a bit like a motorcycle wing mirror. 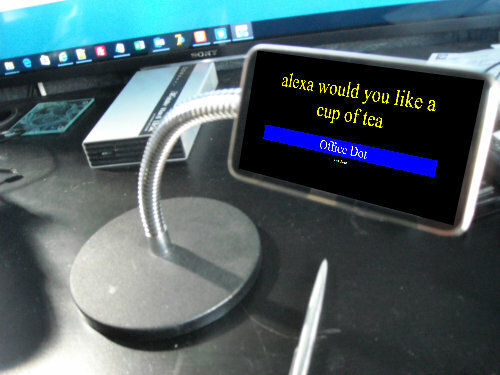 It shows a message (Which I had to photoshop on because the original was too blurry) 'Alexa would you like a cup of tea' this was the last thing that Alexa heard. Doesn't matter that Alexa didn't actually understand the request, it still got logged into the Alexa history and my application read it and sent it out to all mobile devices on the home network. It also shows which actual Echo or Dot heard the question so you even know where the person is that asked it. Also, your uncle can reply through Alexa and whatever he says gets logged in history and so that then appears on mobile devices. That's pretty Cool, Jez... and may be helpful in the future... but for now, My uncle is the only one that has hearing issues, and the alert system was thought out so he could try and watch a movie with headphones on... and not miss an alert if needed. So far I think this will be fine, and there are some options available for future expansion as well (including the possible use of the system you are showing above). Thanks for sharing that for sure! You could hook up wireless headphones to the TV.